Telefónica I+D (R&D) and SEAT joint initiative to integrate Information Technologies on the automobile using multimodal interfaces with a focus on security, communication and entertainment. 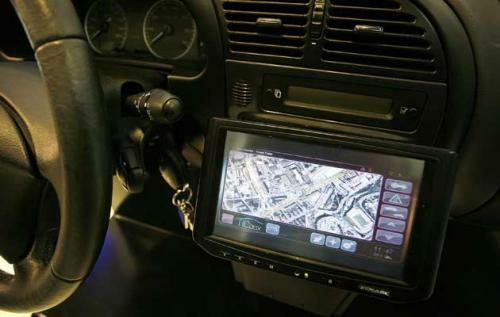 Automobile manufacturers were integrating navigation and entertainment systems on their vehicles, and Telefónica I+D (R&D) and SEAT joined efforts to investigate this area. 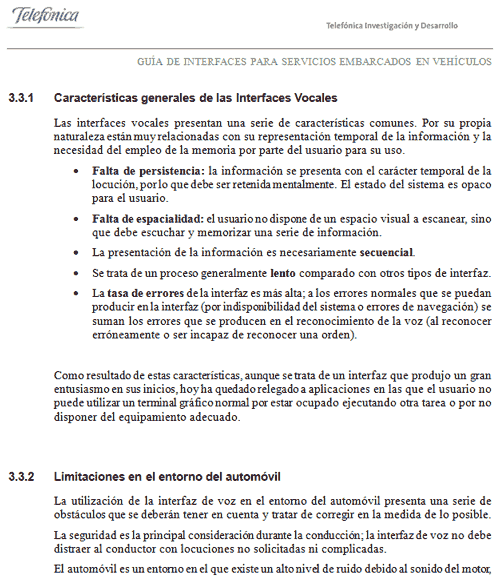 Security was particularly important, following EU directives to reduce road accident’s deaths through early-warning systems, and wireless communication (an important point for Telefónica) and in-car entertainment were secondary objectives. The result was a prototype which could trigger an emergency call in case of accident, delivering extra information wirelessly to the emergency center. The onboard system doubled as a communications and entertainment system, operated through multimodal (touch and voice) interfaces. 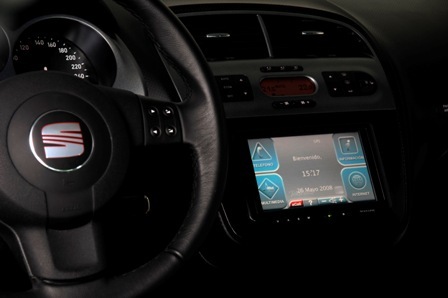 Met with stakeholders and researched usability, particularly regarding onboard, touch and voice systems, which led me to design the touch interface for the eCar, including its Information Architecture. Simple wireframes were created with Powerpoint to illustrate the different screens, which were later implemented in the final prototype. 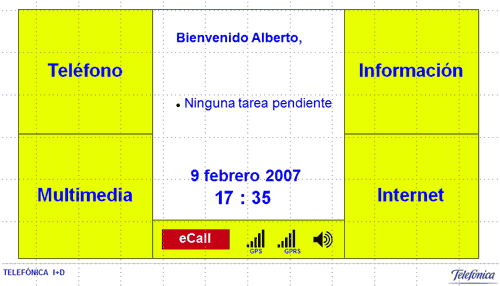 As a secondary result, a “Usability Guide for Onboard Systems” was created which recorded my research on usability in the subject, and was a reference for later teams working on onboard systems at Telefónica. An introduction to Usability and Information Architecture. Experience with onboard systems and touch and voice interfaces. Met with Usability teams working at other branches of Telefónica. 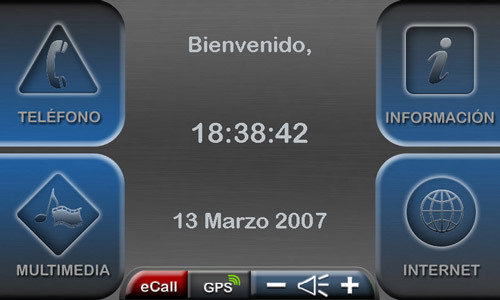 After going through research and prototype stages the system was presented by Telefónica at Mobile World Congress 2009 under the name “TIC Box”. Online supermarketeCommerce Information ArchitectureTempos21, part of Atos Origin, had to build an online supermarket front-end around his eCommerce back-end. They contacted me to help shape the User Experience of the service and create its Information Architecture. O2 HealtheHealth services interface redesignElectronic Health is a strategic field for our future, given its potential to reduce costs and optimise procedures. Telefónica was conducting several pilot projects in this field, with Telefónica I+D providing development. User Experience team was called in to refine interfaces for future commercialization. eBooksMobile and tablet e-book applicationAt MWC 2010 Telefónica announced that they were working on an e-book distribution and reading platform, and it was to be ready for Christmas. When they had to design its mobile and tablet applications, they turned to Telefónica I+D looking for our help. O2 Partner PortalWholesale premium SMS portalO2’s Partner Portal is an online wholesale service that allows companies (that act as resellers for smaller businesses) purchasing premium SMS services. A new version was designed and developed by Telefónica I+D looking to solve previous version shortcomings. TeraboxCloud storage web and mobile interface redesignTerabox is Movistar cloud storage service, free for ADSL subscribers. Its first version was underperforming due in part to an over-complicated user interface. Telefónica I+D redesigned its web and created its mobile application interface. 3GBox installerInstall wizard for PC applicationTelefónica wanted to launch its 3G modem / cloud storage flash drive (3GBox) at Mobile World Congress 2010, but research had shown some flaws with the install process. An installation wizard was requested. GiffgaffMVNO website’s Information ArchitectureInnovative O2’s MVNO Giffgaff (the mobile network run by you) had to be translated from a great idea into a full-fledged service quickly, and the Information Architecture of its website was essential in achieving long-term success. AmimovilDesktop-to-mobile URL forwardingLooking to promote mobile data usage, Movistar entrusted Telefónica I+D to develop a simple web service that would allow users to transition easily between desktop and mobile web browsing. www.tid.esTelefónica I+D (R&D) corporate web redesignTelefónica I+D (R&D) corporate website looked dated for a company that wanted to embody web standards and best practices, so a structure and content redesign was requested. FotologRedesign proposal for Terra LATAM’s photoblogging serviceFotolog was losing ground against other Web 2.0 services and we at Telefónica I+D created a proposal, based on competitive research, polls, interviews and co-creation, to update it to current standards. eCarTelefónica & SEAT Connected CarTelefónica I+D (R&D) and SEAT joint initiative to integrate Information Technologies on the automobile using multimodal interfaces with a focus on security, communication and entertainment. OdinTelefónica’s Wholesale reseller PortalWholesale system which allowed resellers purchasing Telefónica’s huge portfolio of products and services for their customers. Worked at its web portal as Functional Analyst, meeting with stakeholders and turning their needs into development requirements afterwards.